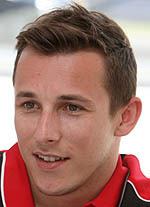 We are delighted to announce that Christian Klien has joined the Pitpass team and will be providing readers with a unique insight in to the world of motor racing. The 29-year-old Austrian was the first Red Bull development driver to reach Formula One, competing in more than fifty Grands Prix between 2004 and 2010. He worked alongside 2009 world champion Jenson Button while acting as test driver for Honda, and achieved a podium result at the Le Mans 24hrs for Peugeot in 2008. Since leaving Formula One at the end of 2010 Klien has driven in a number of different series, most recently V8 Supercars in Australia. Klien brings a driver's eye perspective and firsthand experience of the inner most workings of the motor sport world. "After being lucky enough to race a lot of different cars I've got a slightly different perspective," explained the Austrian. "Hopefully I can give a new angle and share my opinion on what's happening in motor sport each month." Red Bull (and Ferrari) rubbish Vettel claim.